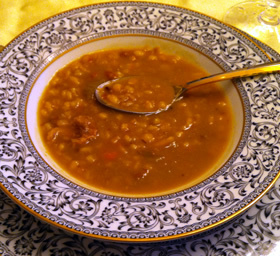 What could be better than homemade mushroom barley soup? This is so good..
Soak the mushrooms for 1/2 hour. Drain the mushrooms, saving the water. Chop up the mushrooms and carrots together in a food processor. Add all the ingredients together including the mushroom water. Bring to a boil, then reduce heat to a simmer. Cover and cook for 2 hours. Remove the beef bones. You may cut cut up the meat from the flanken into small pieces and leave it in the soup, or remove it is you desire. For more soup, use 2 packages of vegetable, mushroom, barley mix and 7 cups of water.